There is something to be said for the epic song, and so I’m going to say that something. They are those types of songs that you always hear in movies, or towards the end of a really dramatic TV show. They are larger than life. I like to imagine my life with epic songs playing in the background – I like to imagine that you could purchase my soundtrack for $17.95 someday. I’m convinced that U2 is the greatest band of all time. I know everyone says that. I’d like to say that I was a fan before everyone got all hyped up about them again when they released All That You Can’t Leave Behind… all that aside though, U2 are the masters at the epic song. My friend Jon will quickly point out that they did not invent the epic song, but I hold that they certainly popularized it and brought it to a new level. Anyone who has seen them play “Streets” live will agree. There’s something about bands that come from small islands in the North Atlantic that makes them incredibly good at creating epic songs. I’m speaking of course mainly of England, Scotland, Ireland, and believe it or not, Iceland. Maybe it’s because these small islands are in fact small nations, and being a small nation you’re always getting picked on by the other guys – makes your national history riddled with war and the need to fight to survive (think Braveheart). The epic song captures that spirit I think. The fight, the struggle, followed by victory… sometimes followed by defeat… but there’s this passion indwelt within, and whether victory or defeat is the outcome, you can’t help but recognize that the fight was a good one – it’s motive was pure. I think I imagine my life set to epic songs because I want my life to resemble one. And so regarding that soundtrack that you can buy for $17.95… if you want your week to be epic, hop on to iTunes and get some of these very epic songs. Many of them are by bands from small island nations. I’ve tried to limit my U2 songs, but it was difficult. There’s this common theme that runs through all of them though: a simple, quiet beginning, but driving – there’s a pulse behind it and you know there is a purpose, you know it’s going somewhere – maybe it’s to fix the world… maybe it’s just to fix yourself.. You gotta close your eyes – you have to imagine this being played in a huge open dark arena, or on top of some great mountain overlooking the ocean. And then there is this moment where the whole thing opens up, the lights stream down, the fog lifts, and then..… epic. Being that Steph works at a horse hospital, she also works around horse people, and horse people in Nashville are more often than not filthy rich. That being the case, she is sometimes privy to certain opportunities us regular people are not privy too. One such opportunity occurred tonight. Apparently there’s some big horse-type event going on this week in Nashville called the Futurity. I asked all night what futurity means but was not provided any solid answers. Again consulting my friend Webster, it’s a horse race for two year olds in which competitors are nominated at birth. This will become the most educational blog on the web. So tonight is the big celebration – a big private party for horse lovers hosted by none other than Brooks & Dunn. Believe it or not, I have lived in Nashville for six years and have never had a true country music experience. Tonight was my time. I learned many things tonight. Too many to name here. For starters, let’s just say that 400 cowboys + open bar = 400 cowboys who should not be riding their horses home. Steph is quite certain that somebody spiked her Southern Baptist Convention approved Coca-Cola. Who knows. Granted, she is out like a light right now… we’ll find out tomorrow I guess. And you know those people at concerts who have this otherworldly ability to roll their tongue and whistle really loud? No, I don’t mean really loud… I mean ear piercing shriek, like the Nazgul from Lord Of The Rings. Scary creatures. I do not like you people. I always end up standing in front of you at concerts. I will knock you out next time. But anyways… Brooks & Dunn. I’m not a fan of country music, and have never claimed to be, but let me be fair and go on record and just say their band was really tight tonight. Amazing good, and really solid. They put on a fine show. Their fiddle player and lead guitarist rocked it. Good times. I knew absolutely none of the songs, but still good times. There were 400 inebriated cowboys at the show who would all concur as well. Favorite Moment Of The Evening: Definitely observing the security guard at the end of the show who was wearing a polo shirt that read “Rock Solid Security – Polite But Firm”. For reasons unknown he was trying to manage 7 doors at once, and by manage I mean he was frantically running between six of them with arms outstretched, trying to keep people from exiting while ushering them all through the one open door on the far right hand side. And I’m not sure why it mattered because all of the doors just emptied out into the lobby anyways. So Steph and I got ourselves a kitten not too long ago. He’s black. He’s little. He’s cute. His name is Linus. And he’s an absolute terror when it comes to anything that is shiny, is made of fabric, or makes noise. The plastic grocery bags fall in the “make noise” category. He likes to play in them after we’ve emptied all the groceries out and loves that they make a crinkly noise whenever he steps on them or bats them around with his paws. This is all fine and well until he gets his neck stuck through the little handle… then he can’t get away from the bag and it follows him through the kitchen as he tries to get away from it. Then it gets caught between his feet and the hardwood floor and he slips, and falls, and meows, and waits for us to help him out. Today we’re in the bathroom and Linus jumps up, and into, the empty bathtub. So we thought, lets have some fun – see what he does if we turn the water on a bit… and he started to drink it. So we changed a bit to a lot and turned the water on full blast, threw the plug down, and watched him. And he just sat there, playing with the water, until it was all the way up to the top of his back. He started “swimming” around… so apparently the cat likes water. Crazy. So that’s our cat. 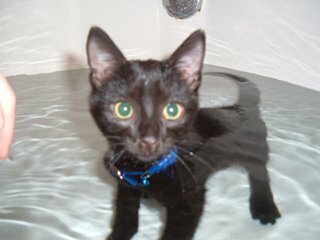 I’ll leave you with a picture of Linus in the tub while I go pull him off Steph’s face….